On this Short Break you’ll travel with a different Driver Guide and group of like-minded travellers each day, for a more diverse experience. On arrival in Auckland you will be transferred to your hotel (flights anytime). Hotel: Scenic Hotel Auckland (Standard) or The Langham Hotel Auckland (First Class), 3 nights. Begin your day with a tour of Auckland’s scenic city highlights, before a break at morning tea time in charming Parnell Village. 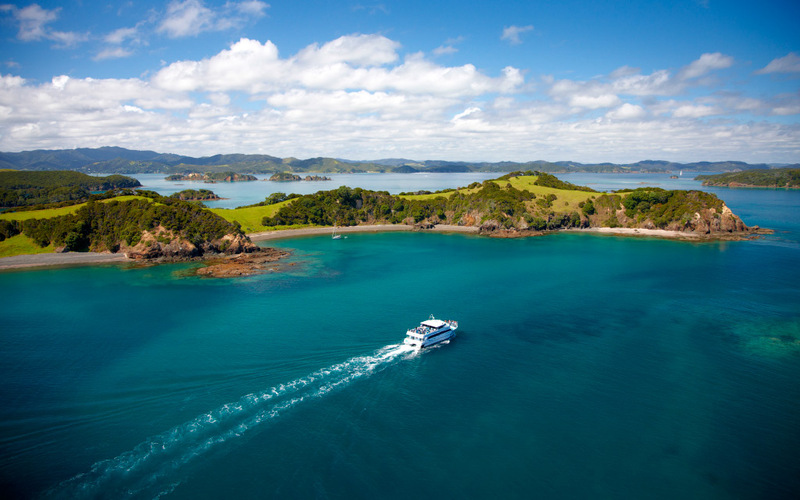 Board a ferry and cruise to Waiheke Island, for a guided tour of three of Waiheke’s premier wineries. Taste the wine at award-winning Mudbrick Estate. Tour the Goldie Room, Waiheke’s first and most well-established vineyard, then experience their range of fine wines accompanied by a mouth-watering nibbles. Later, marvel at the views and stunning architecture while you sample wines at Te Whau winery. Experience New Zealand’s amazing scenery and great wines. Wine tasting in Kumeu Wine Country dates back to the 1930s when families of Croatian origin established wine-making in the area. Visit the families who are still living and working in the area, making some of New Zealand’s most renowned wines. Your first tasting is at Nobilo Wines, the second largest wine producer in New Zealand. Then enjoy a short morning tea stop before tempting your taste buds at Matua Valley Wines. Choose from premium wine through to the everyday offering. Travel a short distance to Soljans Estate Winery. Soljans has won many awards for their wines. By skilfully marrying traditional with modern techniques, they produce stylish, richly flavoured wines. They are widely acknowledged in New Zealand as being an expert producer of methode traditionelle (bottle-fermented) sparkling wines. Enjoy lunch and a glass of wine at Soljans Café. Next you’ll have the chance to see one of the world’s largest seabirds in their natural environment, the gannet. Here you get a close-up view of their behaviour without disturbing their environment. Your final tasting is at West Brook Winery. The wines reflect true varietal character and their unique regional origins. You’ll be transferred to Auckland Airport for your onward flight (flights anytime). Note: This itinerary is valid for departures after 1 October 2015.